Want to make a lot of money? Become a doctor. That’s the basic message behind our new map breaking down the highest paid occupations in every state. Almost every single top-ranking job is in the healthcare field. 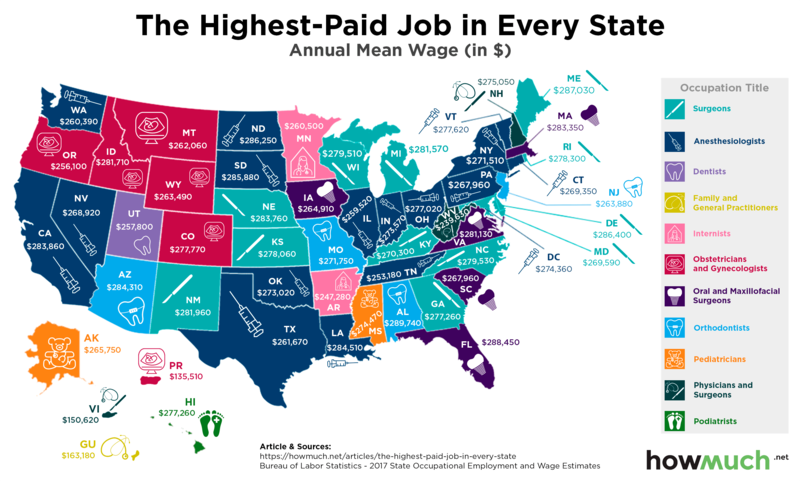 We have together a list of the highest paying jobs in every state based on annual mean wage figures, according to the U.S. Bureau of Labor Statistics. We created a color-coded map by occupation, letting you easily see the regional patterns at the highest end of the labor market. At the macro level, all the top paying jobs are from the medical profession. That’s because we’re looking at annual mean wages for large groups of people. Only some actors in California, for example, make millions of dollars. The vast majority of people don’t make very much money creating films. But doctors and dentists generally make tons of money no matter where they live. The real question then is which types of medical professionals make the most money. Across the Northwest, there’s an obvious cluster of obstetricians and gynecologists. Internists are the highest paid in only two states, Minnesota and Arkansas. Anesthesiologists do pretty well no matter where they work. Interestingly, our map indicates there isn’t much variation in average incomes for the highest-paid jobs across the country. Every state boasts a wage around $250k to $390k with the exceptions of Puerto Rico ($135,510), the Virgin Islands ($150,620) and Guam ($163,180). No occupation makes millions on average, and yet, regardless of where you live, if you work one of these jobs you can expect to make some decent coin. This means that the real differentiating factor to consider is the cost of living, which determines how much money people keep after paying for their basic necessities. For example, the cost of buying a house is outrageously expensive in California compared to Ohio. An anesthesiologist only makes on average about $7,000 more in California than Ohio, but he or she would likely pay tens of thousands more housing. Although we don’t recommend picking a job based solely on how much money you’d make, it’s always helpful to know where you stand for both income and expenses.